Catherine Galasso presents an evening of works by and in collaboration with choreographer Andy de Groat, as well as a new work inspired by him. Andy de Groat’s choreography places spinning and pedestrian movement within a complex framework, presented with a keen sense of timing, phrasing and rhythm. 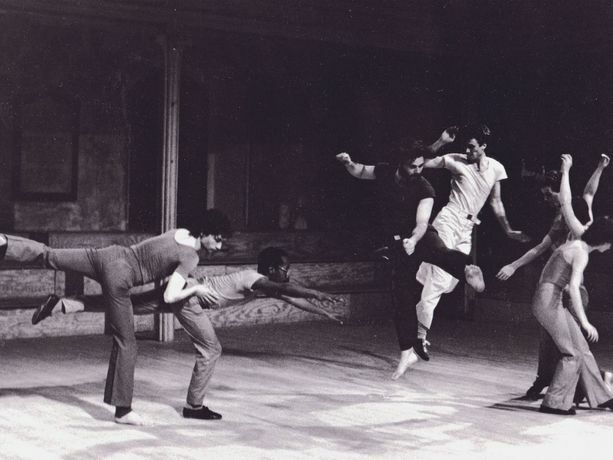 This evening remounts de Groat’s Fan Dance (1978) which had its original premiere at Danspace Project in the years after its founding, and Rope Dance Translations (1975). Both works feature original music by Galasso’s father and frequent de Groat collaborator, Michael Galasso. The program includes an inter-generational cast of contemporary downtown performers alongside original members of de Groat’s company. A study of aesthetic lineage that is part-tribute, part live-archive, part new work, this is an evening of dance history re-imagined, where research material is visible alongside a world premiere.